I don’t necessarily call myself a crafty person. I do enjoy DIY home projects, but arts and crafts aren’t typically my thing. That is unless… it’s easy. 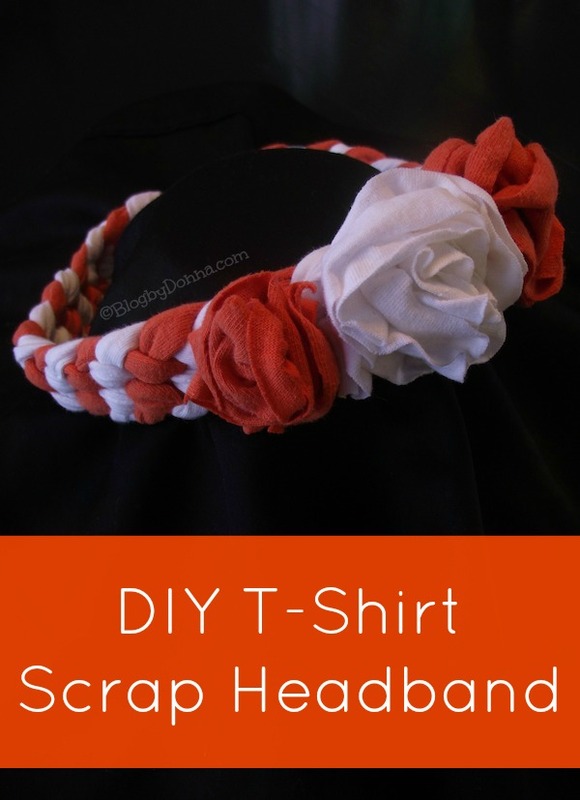 Here’s an easy DIY T-Shirt scrap headband tutorial that’s fun, and if you have girls, they can make their own. You can use any color combination you want. Since I’m a huge U.T. fan (Go Vols), I chose orange and white. 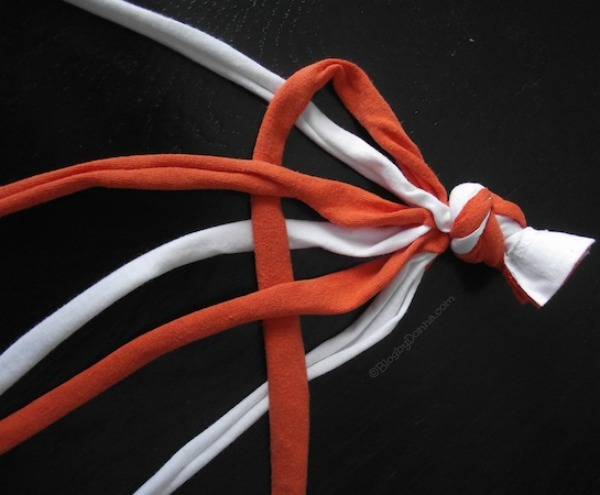 Begin by tying the six full size strips of t-shirt together or sewing across the ends of all six pieces. Separate the strips, alternating colors. 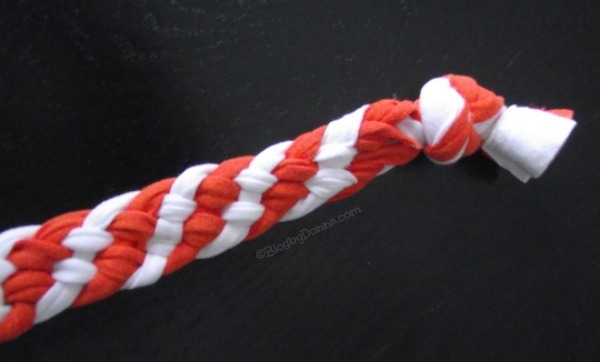 Begin braiding the strands together by weaving the strips from left to right. The first strip will go over the 2nd, under the 3rd, over the 4th, under the 5th, and over the 6th as shown. Repeat this step, working left to right until you reach the end of all of the strands. 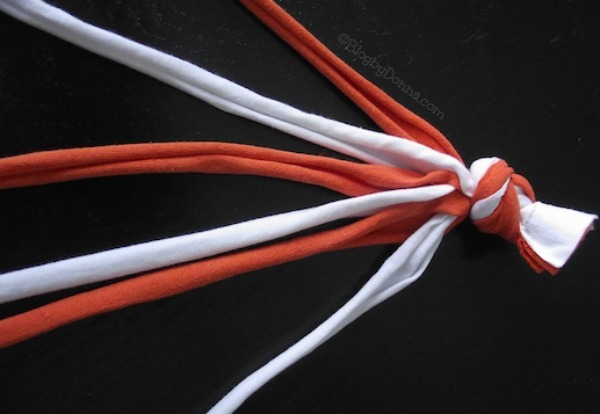 When you reach the end, either run the strands through the sewing machine to secure or sew with your needle and thread. Unknot the other end, and sew the two ends together (inside out so the seam will be on the inside of the headband when worn. Next, you’ll begin making the decorative flowers. 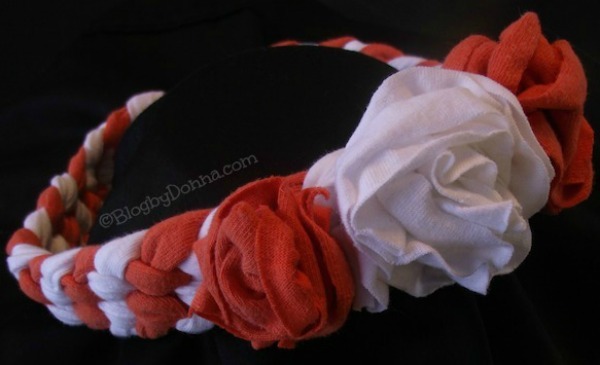 While there are several options for making easy flowers, this headband features a quick and easy option. 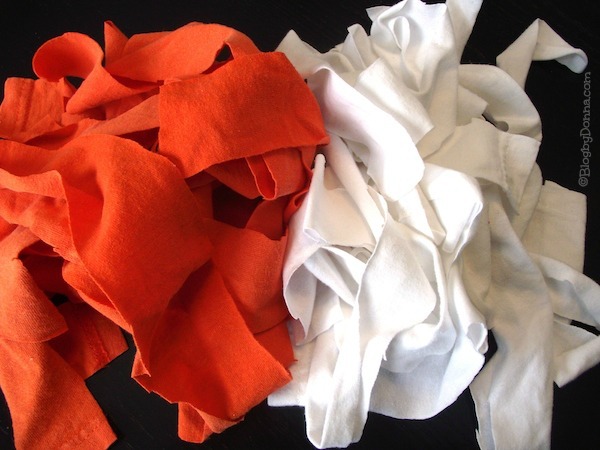 Begin with a strip of t-shirt in one of the two colors and fold it in half. Prepare your needle and thread with enough thread length to gather all of the t-shirt onto it. 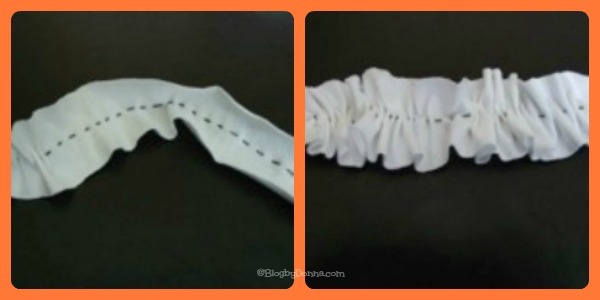 On the folded side of the folded strip, begin gathering it onto your needle and thread. Once you’ve reached the end and all fabric is on the thread, pull to gather the fabric as shown. 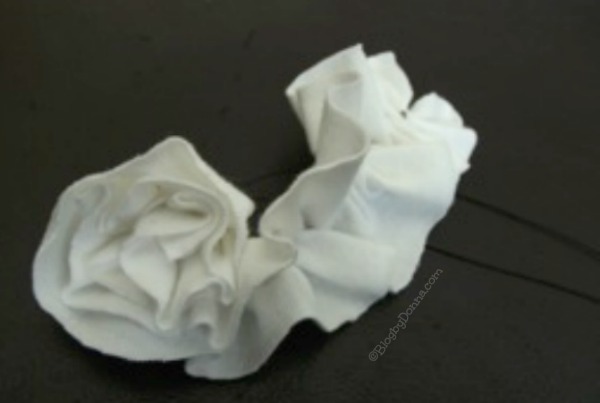 Begin coiling the fabric and tacking it together with your needle and thread until you’ve created a flower. Repeat with additional sizes & colors of flowers. Finally, attach the flowers to the braided band with your needle and thread, making sure to secure well. 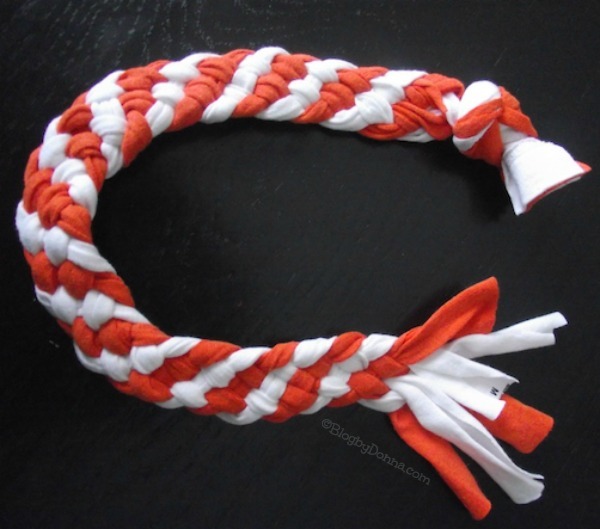 What colors would you make your DIY T-Shirt Scrap Headband? I have seen these but never seen a tutorial, thanks for sharing! Looks easy enough! This reminds me of crafts I used to do when I was young.. May see if I still got it. What a great way to re-purpose old t-shirts. What a great idea! I’d probably do something neutral or green. I love this & it came out so cute. That is awesome! I love that there is no machine sewing involved, so I could probably pull it off. This is SO super cute! I bet my little girl could try her hand at these. I’m not really a crafty person either, but I’m going to attempt this. I love wearing headbands! What a super cute idea and I bet my girls would totally love this! How fun! I wish I had a little girl to make one for, but I might just have to send one to my niece! That is an adorable headband. I know I have scraps of material around the house. What a great tutorial, I think I could even handle this and I’m not crafty at all. I have a friend who does crafts for the girls at Girl Scouts, I’m going to send her to the post because I bet the girls would love doing this. What a fun way to make use of old shirts! I’ll have to add this to my list of crafts to do with my daughter! This headband is super cute! That’s a great way to recycle old t-shirts. Ooo, I’ll bet I could actually pull this off and boy, do I have a supply of t-shirts!